One of my most used commands in the VBA editor is was the Last Position command. If you do not know this command yet, here is a quote from the Visual Basic User Interface Help file. Allows you to quickly navigate to a previous location in your code. Enabled only if you edited code or made a Definition command call and only when the Code window is displayed. Visual Basic only keeps track of the last 8 lines that were accessed or edited. This command is very helpful while writing code. And it could be super helpful while debugging code as well. - Except that it isn’t. Well, I assume you know this command already. So, let me ask you a couple of questions. Did you ever miss Last Position while debugging? Did you ever wish for a visual list of the last code positions? And did you ever wanted to go back to a previous position, using Last Position, only to notice after 8 steps back, that the desired position is not in the history anymore? I would be really surprised if you did not answer Yes at least 3 times. As for me, I would answer all the above questions with a resounding Yes! I also work quite a lot in Visual Studio. There is a much better navigation history included. It is available during debug, it has visual dropdown history list, it tracks read only code positions, and it has a much bigger number of history items. I thought, it should be possible to create a similar navigation experience in the old fashioned VBA Editor as well. - Here we are. 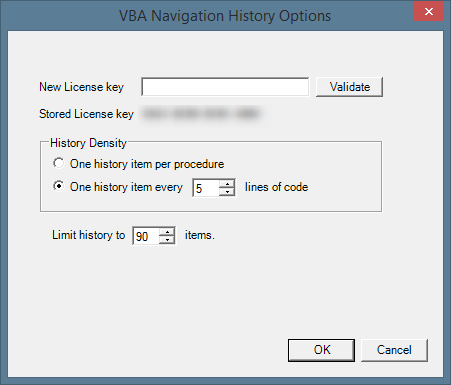 VBA Navigation History is finally available to the public. Are you annoyed by the Last Position command in the VBA Editor too? - Then VBA Navigation History is for you! VBA Navigation History is a very small utility and its visible user interface elements are actually very few. The core user interface item of VBA Navigation History is the navigation toolbar. There is a Back Button and a Forward Button. Straight forward. The Back Button is actually not just your standard button but kind of a hybrid between a button and a popup dropdown. The use of the Forward and Back commands should be pretty intuitive. If you click the area of the downward pointing arrow, a drop down list with all the tracked historic positions will be displayed. The current position in the list is indicated by an arrow icon. You can choose any position from the list. Currently there are only few configuration options. New License Key - You can enter your purchased license key here and click Validate to store the license key. History Density - You can either track one position per procedure, or one position every X lines of code. Limit history to X items - Maximum number of tracked history items. A huge number may impair the speed of the list dropdown. Download a free trial version now. The current version 0.9.4 of VBA Navigation History is in beta stage. This download is fully functional until April 1st 2018. After that date it will revert to trial mode (fully functional for 60 Minutes after the start of the VBA Environment). You can buy a license for 10 EUR per User! This license is perpetual for the version of VBA Navigation History you bought it for. Payments are processed securely by Avangate, a leading global provider for digital commerce solutions. The license key converts an existing trial installation into a full installation. No need to reinstall. VBA Navigation History is a commercial product. You need to buy a license to use beyond the free trial mode (fully functional for 60 Minutes after the start of the VBA Environment). The license covers one developer and it can be used on multiple computers. You need to buy a licenses for each developer working with VBA Navigation History. This product is “sold as seen”. There is no warranty and no guaranteed support. System requirements are pretty basic. The history navigation toolbar currently pauses to update itself if it is not docked either to the top or bottom of the VBA Editor Window. The floating toolbar reacts with a history back click when you try to drag it to another position. If you move around in code with the built-in Last Positon feature, this move is sometimes not detected by VBA Navigation History. Currently it is not possible to use keyboard shortcuts to navigate backward and forward. This might be added in a future version.